The rules and guidelines that state agencies use to develop their annual budget requests are developed cooperatively between the Governor’s Division of Financial Management and the Legislature’s Budget and Policy Analysis staff. Both the Executive and Legislative budget staffs are involved in providing input and assistance to state agencies over the summer months as they develop their new budget requests. The agency budget requests, when completed, are required by statute to be submitted on September 1st simultaneously to the Governor’s Office and the Legislature’s Budget and Policy Analysis staff. The Governor’s Budget Recommendation is featured prominently in the Legislative Budget Book, the primary source document for the Joint Finance Appropriations Committee. 67-437. DEPARTMENTS, AGENCIES AND INSTITUTIONS TO SUBMIT INFORMATION. All departments, agencies and institutions of state government which are required by Section 67-3502, Idaho Code, to submit reports of actual and estimated receipts and expenditures to the Division of Financial Management shall submit the same information to the Legislative Services Office for the Joint Finance-Appropriations Committee, not later than the deadline prescribed in Section 67-3502, Idaho Code. 67-3502. FORMAT AND PREPARATION OF ANNUAL BUDGET REQUESTS. For the preceding fiscal year, each of the entities listed above shall report all funds available to them regardless of source, including legislative appropriations, and their expenditures by fund and object of all sums received from all sources, segregated as provided for on the forms. For the current fiscal year, each of the entities listed above shall report their estimates of all funds available to them regardless of source including legislative appropriations, and their estimated expenditures by fund and object of all sums received from all sources, segregated as provided for on the forms, including a statement of the purposes for which anticipated funds are expected to be expended. An estimate of appropriations needed for the succeeding fiscal year showing each primary program or major objective as a separate item of the request and itemized by object code. A report concerning the condition and management of programs, program performance and progress toward accomplishing program objectives. The completed forms shall, not later than the first day of September except with special permission and agreement of the administrator of the Division of Financial Management and the director of Legislative Services Office, be filed in the office of the administrator of the Division of Financial Management and the Legislative Services Office. The legislative and judicial departments shall, as early as practicable and in any event no later than the first day of November, prepare and file in the office of the governor and the Legislative Services Office upon the forms described in this section a report of all of the information required in this section. 67-3505. BUDGET INFORMATION SUBMITTED TO GOVERNOR. The administrator of the division shall, on or before the 20th day of November next succeeding prepare and submit to the governor, or to the governor-elect if there is one, information for the development of the executive budget as designated in Section 67-3502, Idaho Code, including the requests of the legislative and judicial departments as submitted by those departments. 67-3514. APPROPRIATION BILLS TO BE PREPARED BY JOINT FINANCE-APPROPRIATIONS COMMITTEE. 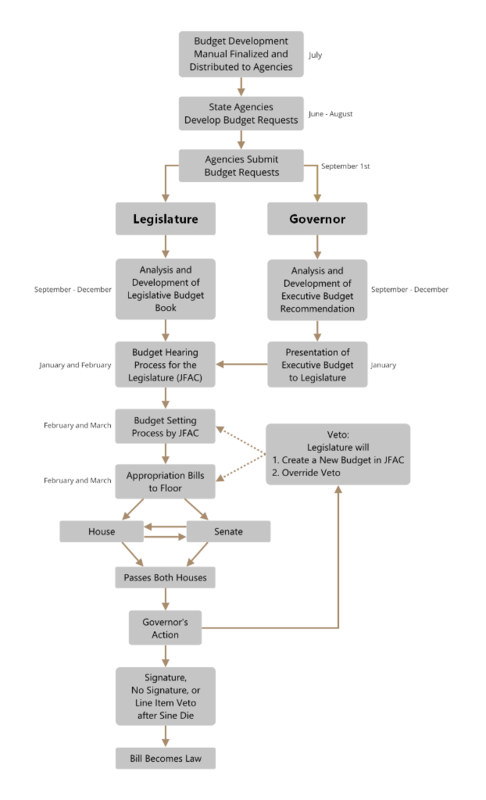 The joint committees of the legislature in charge of appropriation measures, after considering the budget requests required by Section 67-3502, Idaho Code, and the executive budget as required by Section 67-3506, Idaho Code, shall prepare and introduce appropriation bills covering the requirements of the various departments, offices and institutions of the state. In the case of any department, office or institution operating under a continuous appropriation, the joint committee may prepare and introduce appropriation bills covering the requirements for the administrative functions of such department, office or institution. The joint committee may, after examining the budget of any department, office or institution operating in part or in whole under a continuing appropriation or fund authorized by the legislature, prepare and introduce appropriation bills covering all the requirements of the respective department, office and institution. Biennial line item agency budget with lines for salaries and wages, travel, printing costs and other current expense, capital outlay and other items with no program breakdown. Legislature reviewed the Governor’s Budget, haphazard hearing process. Biennial line item agency budget with lines for salaries and wages, travel, printing costs and other current expense, capital outlay and other items with no program breakdown. JFAC gradually develops more formal hearing process to review Governor’s budget recommendation. Biennial line-item program budget with programs, minor programs, program descriptions and workload indicators. First annual line item program budget. The Idaho Legislature also establishes its own budget office, as a result of the Governor failing to present a budget to the Legislature. Program budget with programs, and program descriptions, with an incremental approach that showed the cost of continuing the 1971-1972 level of services and introduced multi-year estimates for 1973-1974 and 1974-1975 fiscal years. Program budget with a modified form of zero-base budgeting that used different “Levels” of funding; Level I, Level II, or Level III. Program budget with a pure form of zero-based budgeting for about 25% of the state agencies. The budget contained decision units that built from a zero base, explaining the impacts of each level. Program budget with a modified form of zero-based budgeting. About 25% of state agencies were required to build a budget request starting at a base of 70% of their current appropriation. Program based budget; program descriptions and workload indicators. Governor’s recommendation integrated into the Legislative Budget Book. Program based budget, with requirements to submit performance reports in the budget process as a result of the passage of the Strategic Planning Act in 1995. Program based budget, summarized at the agency level, with increased emphasis on performance indicators from agencies’ Strategic Plans, and issue analysis and supportive information in addition to budget request information.